House sparrows are small, stocky songbirds that are ubiquitous all over the United States. They have thick bills and brown feathers with streaks of black on their backs. These birds prefer crevices and holes in man-made structures rather than naturally occurring nesting sites and are found to live in close proximity with human beings rather than in extensive forests or woodlands. Ecosystem consists of the biotic components that consist of all the organisms along with the abiotic components that include the physical and chemical factors in a particular locale. The biotic and abiotic components interact with each other, during which exchange of energy and cycling of elements take place. The organisms that provide the path for energy flow form a food chain. It starts with the producers (plants) that convert sun's energy to food that the primary consumers (herbivores) feed on. The secondary consumers (carnivores) acquire this energy when they eat the primary consumers. Sparrows mostly prefer seeds of millet, grass, thistle, weed and sunflower seed. However, they also eat fruits and berries. 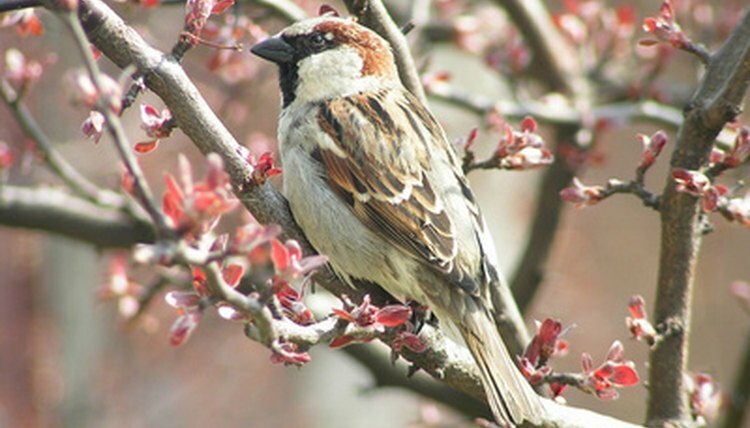 During this process, sparrows spread seeds to places away from the fruit tree. This is important for germination of the seeds, because if the seeds fall close to the parent plant, they would have to compete for nutrition with the mature plant. This would reduce the chance of germination of the seed as well as growth of the plant once the seed germinated. By spreading seeds, sparrows help the survival of many plants that are the producers in an ecosystem. Although primarily seed-eaters, sparrows also feed on small insects and worms such as caterpillars, beetles and aphids. Some of these creatures destroy certain plants. Sparrows keep their population in check; otherwise, the insects would have eaten certain plant species to extinction. Here also sparrows play an important role in preserving the ecosystem. Most birds of prey, such as eagles and falcons, eat other smaller birds. Snakes, which are also secondary consumers, are known to eat sparrows. For example, sharp-shinned hawks prefer sparrows for food.. Hence by providing food for the secondary consumers, sparrows play an important role in their survival and in preserving the ecosystem. House sparrows were first brought to the United States from Europe in the 1850s, when about 100 birds were released in New York. Since then, these birds have become well established all over the United States. According to Tina Phillips, Project Leader of the Birdhouse Network started by the Cornell Lab of Ornithology, house sparrows compete fiercely with native bird species for nesting sites. The lab confirms that the house sparrows destroy eggs and kill the nestlings and also the incubating females to take over the nests of the native bird species. Hence house sparrows may harm the ecosystem by threatening the survival of these native birds.